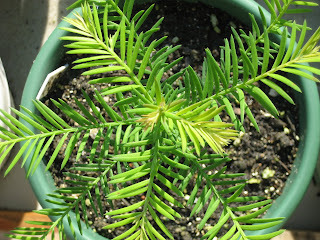 Adventures in growing Sequoia sempervirens (coast redwood) trees from seeds. As these trees get older, the leaves at the top of the trees become needles, which helps conserve moisture in the dry heat of the canopy. The lower branches will keep flat leaves such as these. 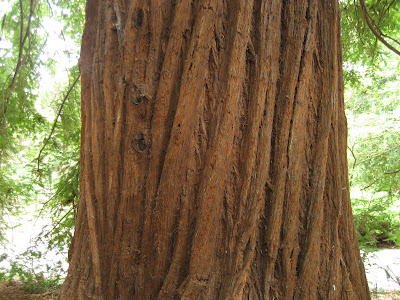 I'm not exactly sure which of my redwoods this is - it doesn't matter. They're all growing huge. 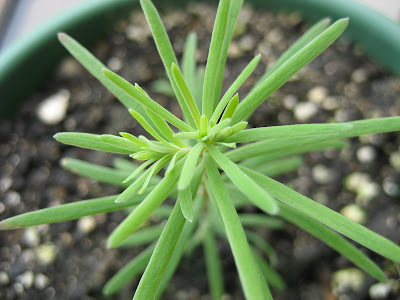 In the past five months, these seedlings have grown almost a foot tall with eight-inch branches. 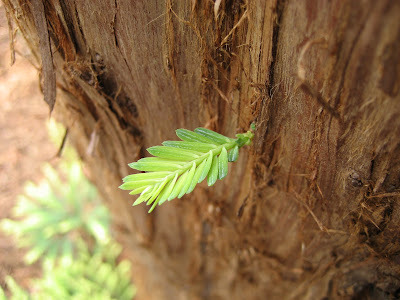 The overhead shot shows how the growth is fairly uniform around the trunk. I started having some browning on my coast redwoods' leaves this weekend, most likely due to the soil not being moist enough. I'm going to make sure not to neglect these - they're already showing to be fragile. Here you can see what's the start of at least two new branches. A few weeks ago, while in the UK, I made sure to stop by at Kew Gardens to see their redwoods. These coast redwoods blew my mind, from the photos, it shouldn't be hard to understand why. 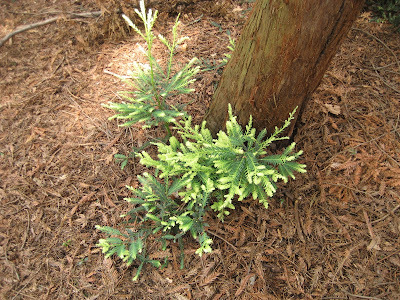 Take a look at the ground cover in the one photo, and the spiral bark pattern in the other. 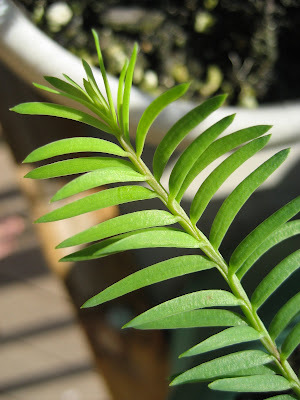 I found this leaf pattern on a few of my coast redwoods. Very interesting, and nice desktop wallpaper. There's been little activity with my coffee filter baggie seeds in the past couple of weeks, so I'm trying cold stratification. 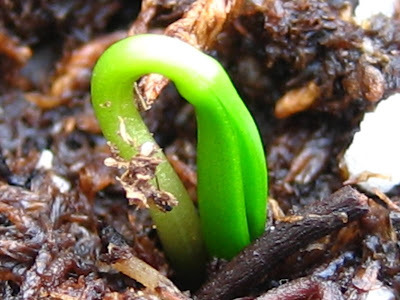 Germination rate in coast redwoods will increase when their dormancy period is overcome by extended periods of near-freezing temperatures. 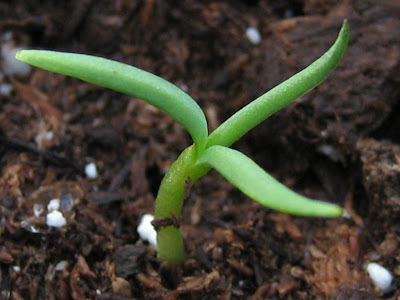 I've moved the seeds into baggies of moist seed-starting soil (mostly peat moss) in my refrigerator. In two months, I'll remove them from the cold, and keep the baggies out in the open where they may receive indirect sunlight. When the seedlings start germinating, I'll move them into their own cel-packs. 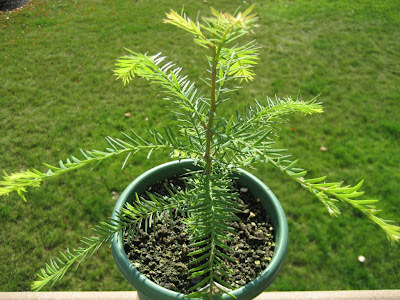 I wrote a more detailed post on cold stratification and the soil baggie method in my giant sequoias blog, if you're interested. 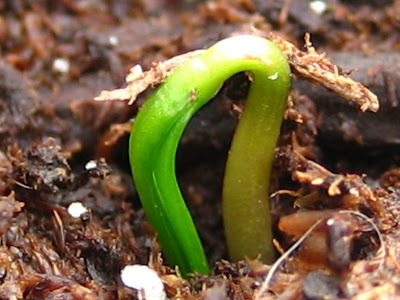 Most of my coast redwood sprouts have two giant cotyledons. This one sports three. 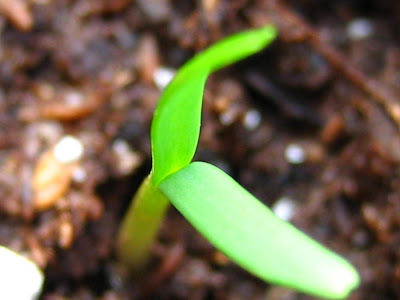 Seed #7 is starting to show its cotyledons (seed leaves). 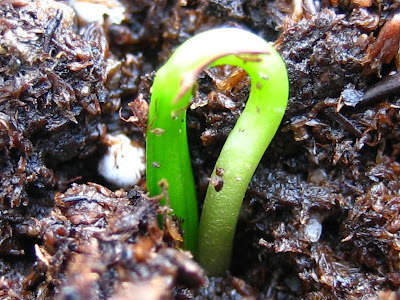 I'm so used to my giant seqouoias' three to four cotyledons that I'm still surprised when I see only two emerging from my coast redwood seedlings. 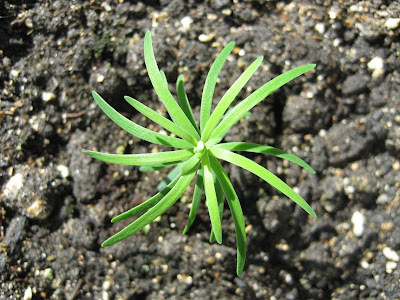 While the giant sequoia seedling generally has between three to five cotyledons, two is normal for the coast redwood. Creative Commons Public Domain License.